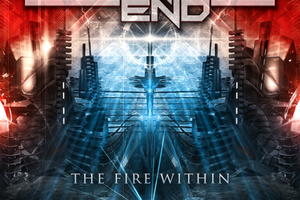 We all have our opinions regarding power metal – certain distinctions exist between the German/European model which tends to favor uplifting melodies, twin guitar/keyboard synchronization and double kick / stunning fill work galore and the American version that can be more steel-oriented and fall closer in line with traditional, classic metal values. 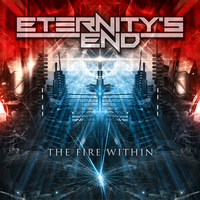 Developing out of ex-Obscura guitarist Christian Münzner’s desires to scratch his melodic power/progressive metal influences, Eternity’s End released The Fire Within in 2016 with Ian Parry on vocals plus help from fellow Obscura/Alkaloid members among others. Shortly after their European label Power Prog Records folded, the public wondered if there would be a follow-up. The stars aligned in the right way, and with a mix of new members plus a few holdovers from said debut, Unyielding takes the quality of intricacies and free flowing musicianship up tenfold – always keeping melodies and hooks top of mind to yield an incredible final product. Neoclassical strains permeate much of the instrumental set-ups and transitions during the title track and “Under Crimson Moonlight” – the type that Shrapnel players like Vinnie Moore and Tony MacAlpine spit forth in the 80’s/90’s, with Christian, fellow guitarist Phil Tougas and keyboardist Jimmy Pitts filling the music landscape with tight, wow-factor main riffs and killer speed notations. Ex-Hibria vocalist Iuri Sanson has a wider upper range than previous singer Ian Parry, which leads to incredible falsettos and multi-octave activities right away for “Into Timeless Realms” and speedier anthem outings such as “Blood Brothers (The Oath)”, keeping every musician and listener on their toes. There are times where you hear hints of Forbidden in the upward to descending guitar parts for “Cyclopean Force” even as the arpeggios fly, while other times it’s like a union of Destiny’s End, Yngwie Malmsteen, and Cacophony for “Necromantic Worship” and “Triumphant Ascent”. 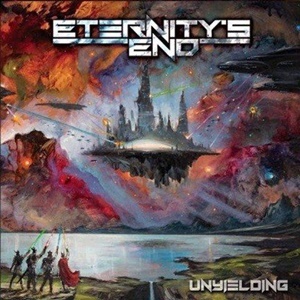 Rest assured that Eternity’s End are propulsive, explosive, and pushing parameters to issue the best power/progressive metal songs they can, never wavering on taking the listener to an aural place they’ve rarely been to before. Spreading out the lyrical/songwriting duties to three of the six members also gives the album a cohesive balance, plus a alien space craft crashing onto Earth creates a sci-fi/mankind concept effort spanning 900 years in time. Considering the nature of recording this material in multiple studios across numerous continents, expert Piet Sielck (Iron Savior) handles the mix as a seasoned vet, paying attention to every last detail to give the proper space for all the information at hand. If you believe that most power/progressive metal is cliché and predictable, Unyielding could be a game-changer to those views – and like Cellador, herald a new era for the genre. It would be a dream if somehow these songs could be performed live, but if not- let’s hope that a third studio offering is in the cards.